RmaReturn is always in one of enumeration's RmaRequestStatus states. If exact enumeration mach wouldn't be found then it's considered to be in a state of AwaitingStockReturn. State changing is controlled by StateMachineBase implementation (RmaRequestStateMachineImpl class). This actually implements the state diagram depicted below and controls state transitions. Return is created as a part of an order. 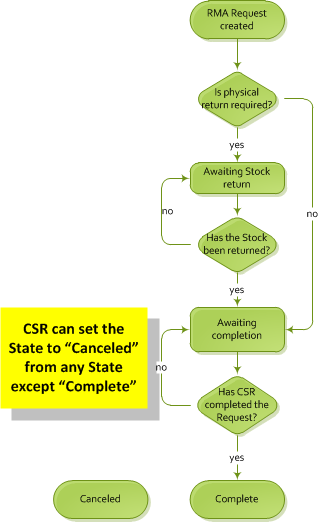 It's initial state can be AwaitingStockReturn or AwaitingCompletion. Return amount is calculated in external workflow, which is accessible trough service. // Recalculates current Return's amounts: fees, subtotals, totals, etc. where InnerItem is instance of RmaReturn. If RmaReturn.ReturnTotal > 0, then "Create Refund" process with ReturnTotal amount should be initialized.